Workspace is a common topic among artists—where can you be most creative? The answers always vary. What doesn’t vary, however, is the fact that a particular location can work better than others. There is a certain kind of space that creates the conditions favourable to accessing a specific part of your mind—the part that is going to write the novel, or decorate the pot, or play the perfect phrase of music. As the holidays began to fade out, and a new year began, Maureen and David turned their attention back to their business. As they do every year, they began with talk of space. They walked the gallery and studio together, discussing new shelving, tidying up displays, wiping down their work counters. They threw out cracked pottery to make room for new work. In reclaiming their physical space, they were also organizing their mental space, clearing their minds of clutter, making room for thoughts of new work as they stored away thoughts of old. 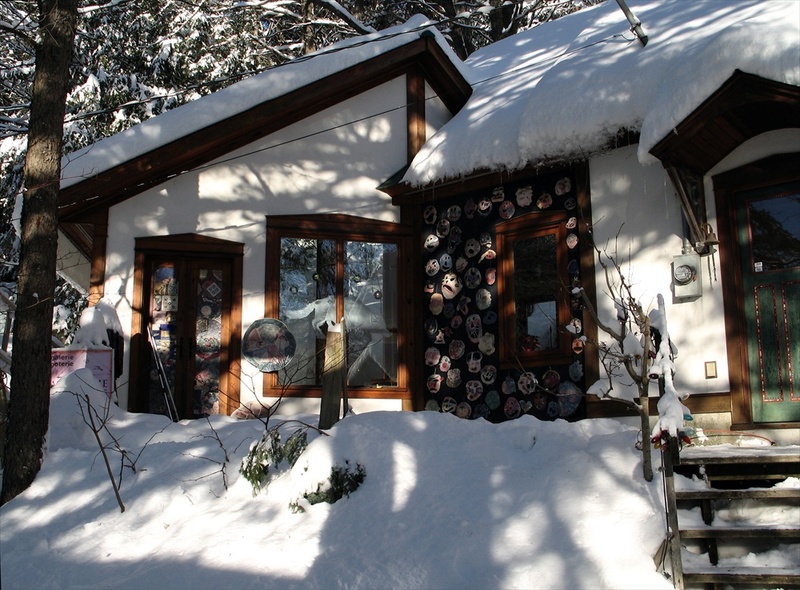 Maureen and David often think about their studio and how it affects their work. First, on a practical level, having their own studio, as opposed to sharing one with other potters, gives them the freedom to develop an original style by using their own technology—glazes, colours, clay, kilns. The size of their studio also influences their work. 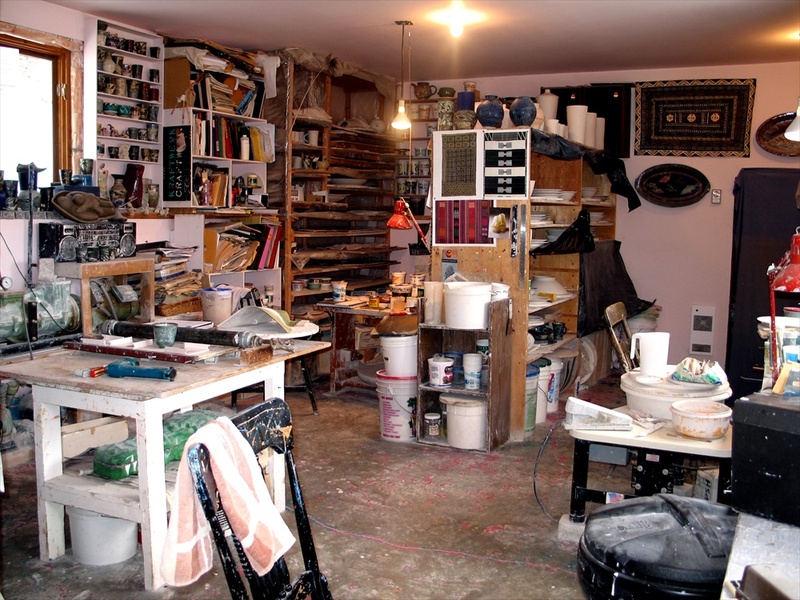 If they had a bigger studio with more shelving space, the production cycle—throwing, trimming, decorating, glazing, firing—would be longer as they don’t start decorating until their shelves are full. With a shorter cycle in a small studio space, the results come out of the glaze kiln more often. The fact that you get results back more quickly means you can constantly be tweaking your glazes and colours and new ideas can be tested and evaluated more frequently. 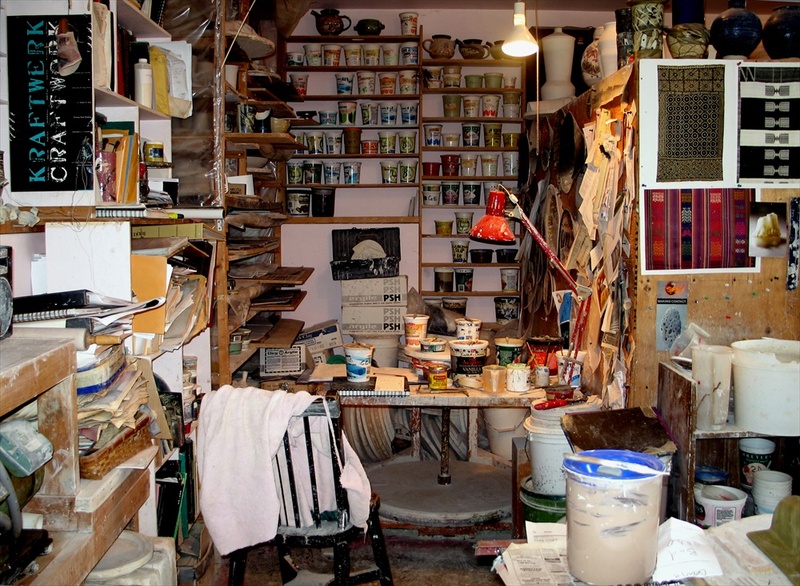 David suggests that they cover their pots with as many images as they can because they are used to working in a space that is covered itself—with paints, bags of clay, brushes, posters, and so on. 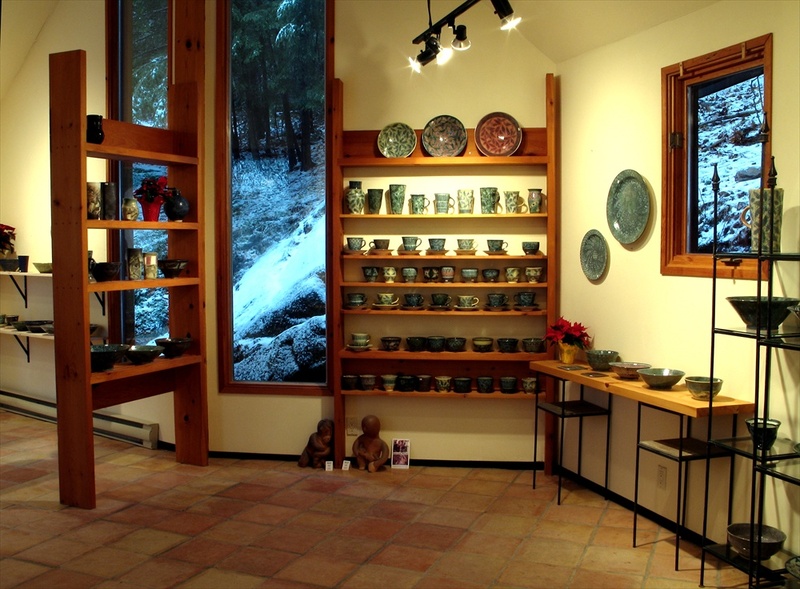 But a small studio with limited shelving space is not a bad thing, Maureen says, because pottery itself is all about working within constraints. Throwing on a wheel tends to restrict you to circular shapes, while the form of a specific pot provides suggestions for decoration. It is these restrictions, she believes, that unleash your creativity. Another spatial consideration is whether you have the studio to yourself. David and Maureen share a studio, but they don’t actually overlap that much. Maureen works in the morning, David at night. Maureen likes the effect the morning light has on the studio; she likes to have control over the radio. You can shape your space, she explains, by using the time of day, the light, music, or what you choose to look at out of your window—in her case: birds, squirrels, the shifting branches of trees. It is important to be able to work alone sometimes, Maureen explains, because that is when you are most likely to achieve what most artists rely on for their creativity: the ability to go into yourself. But, as most of you know, Maureen and David’s work space is also very public. 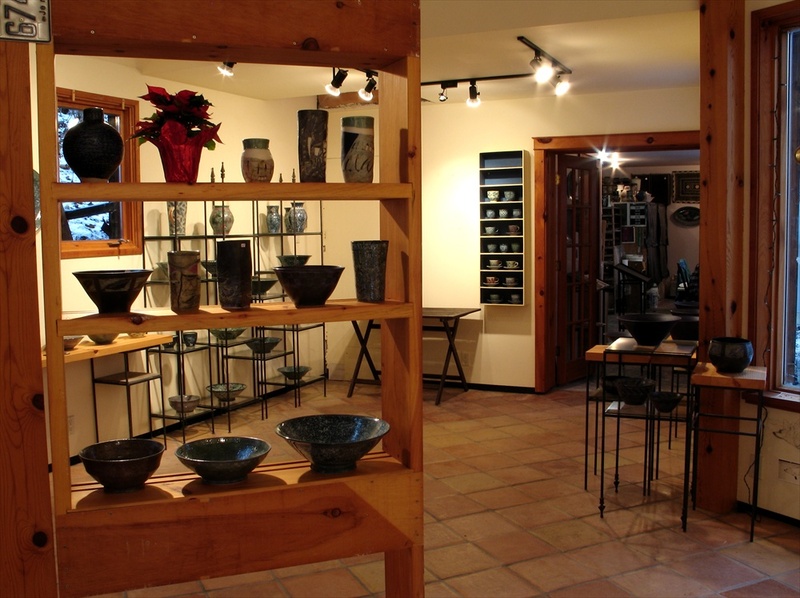 Their studio is attached to their gallery, and clients are encouraged to wander through the studio, to ask questions, to see the pottery in various stages of completion. There are so many steps involved in guiding a ball of clay into a finished piece, which is part of the excitement of working with clay. When Maureen and David explain the steps to someone for the first time, they get to see the process through new eyes. 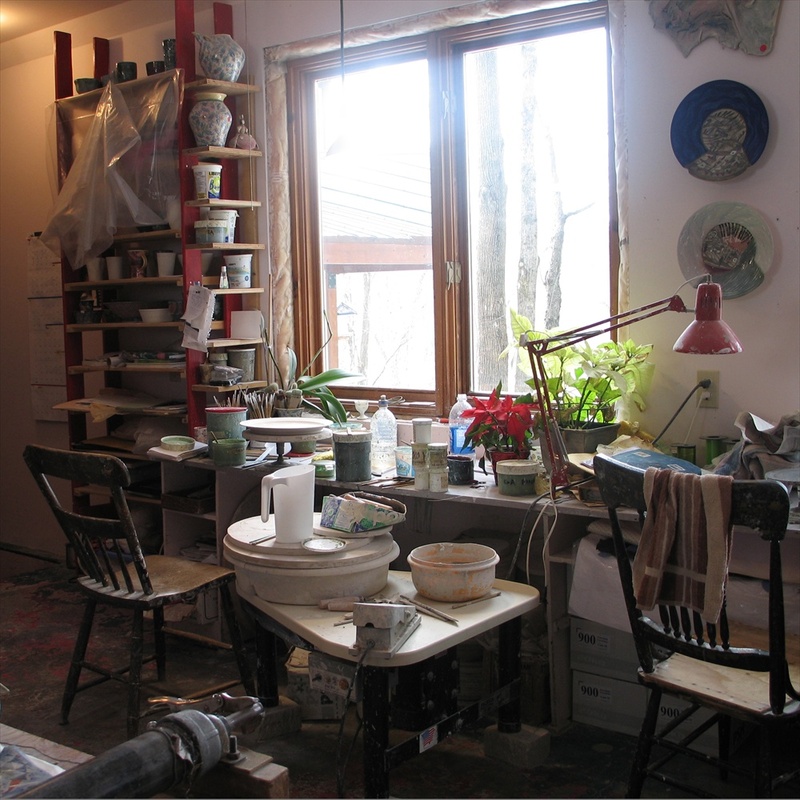 In having a public studio, Maureen and David get to share and have renewed their wonder in the process of their craft. Over the years, there have undoubtedly been grumbles about the space—the smallness of the studio, the choice of music playing, David’s banging and clanging around—but in the end, the best test of a space is to look at the work that is coming out of it. If for decades a mind can find creativity there, the space is probably working out just fine. This entry was posted in Uncategorized by mckenziemarcotte. Bookmark the permalink. Very interresting as always and smartly concluded. Great piece, Allegra! As always, informative, entertaining and thoughtful.